Between the holiday party dresses and the growing number of people on your gift list, chances are you’re looking for fun, affordable holiday presents that don’t break your budget. 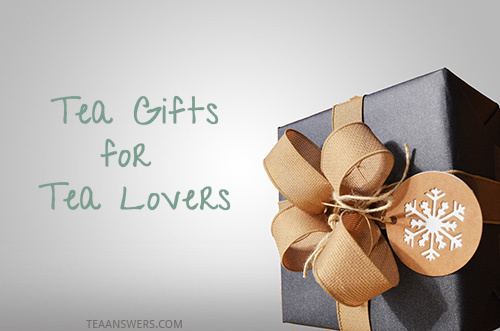 Don’t worry, I’ve got you covered with 23 affordable tea gift ideas. From gifts with teapots and loose tea to candy, these tea gifts are sure to delight all tea lovers, from the tea connoisseur to the beginning tea drinker. The tea lover on your gift list will enjoy this organic tea collection. It contains four organic whole loose teas packaged in an eco-friendly gift box. The individual tins hold 25 servings each, offering a great way to tray a variety of different teas. Only Mr. Tea Infuser could make brewing a cup of tea seem like soaking in a hot tub. This great stocking stuffer is so easy to use your tea lover’s life will never be the same. Simply throw some tea in his trousers, perch him on a cup, and he’ll infuse tea like there’s no tomorrow. This half-pint cream pitcher is a great gift for tea lovers. Made of blown and molded glass, it looks just like the milk cartons you grew up with from the school cafeteria. Both elegant and whimsical, it makes both a nice addition to a tea service and a special treat to bring a smile to your face. Whether it’s holding iced tea or hot tea, this elegant and beautiful glass pitcher brings an artful design to your tabletop. Sure to be a pleasing tea gift for anyone on your list. This stainless steel loose tea travel mug allows fresh-brewed loose tea to be taken anywhere. A mesh filter strains the tea, while a vacuum seal keeps tea hot or cold for hours. Leak proof and easy-to-clean, it’s perfect for those early morning commutes and school runs. A stainless sugar bowl makes the perfect tea companion. It comes with a lid and a spoon, and can be used either for all types of sugar – cubes or regular. It’s perfect for daily use or entertaining. A tea gift guaranteed to put a smile on any tea lover’s face! Did you know tea is the second most popular drink in the world? Or that stirring tea leaves in a teapot makes tea bitter? This charming tea towel is filled with information on tea types, history, and more. Whether you’re looking for a gift for a tea lover or for Mother’s Day, this towel is sure to delight. A gift of this Glass Teapot with Loose Tea Infuser and 12 Flowering Green Teas will delight everyone as the hand-crafted tea unfurls into an exquisite flower right before their eyes. The clear glass teapot makes it easy to watch the magic happen, while providing tea for four people. Whether your tea lover has never tried making sun tea or prefers it above all other teas, this jug by Bormioli Rocco is the perfect tea gift idea. Lead and BPA-free, it can sit out in the hot sun all day to make the perfect sun tea. After brewing, the jug easily fits in a refrigerator where its glass design will not absorb odors, allowing for the pure taste of the tea to shine through. This Glass Whistling Stovetop Tea Kettle is a great way to boil water for tea. It lets you easily see how much water you have in the kettle and how close it is to boiling. It can be used on any stovetop – gas or electric. How do tea gifts get better than that? Affordable tea glasses are a wonderful gift for tea lovers. Able to withstand high temperatures, these stylish glasses allow you to enjoy the radiance and clarity of tea. Teavana’s PerfectTea Tea Maker makes it easy to brew the perfect cup of tea every time. Simply add tea and hot water, and place over a mug to drain. The tea maker will automatically filter the tea as it brews. Looking for a tea gift for women? Brighten up her day with this beautiful Lotus Tea Brewing System. It brews tea using either loose leaf tea or tea bags. It’s ceramic construction helps tea stay hot, while still making it safe for the dishwasher and microwave. A beautiful Japanese cast iron tea cup with a dragonfly motif is the perfect holiday present. The thick cast iron exterior keeps tea warm, while the enamel interior prevents rust. Whether you gift the gift of one or a set of four, the wonderful texture and weight of this tea cup makes every sip of tea a delight. Does your tea lover use a teapot? If so they’ll appreciate receiving this butterflytea drip catcher as a gift. Simply slide the “butterfly” under the teapot spout and clip under the handle, and it will catch any drips, keeping furniture and clothing tea free. These novel teas provide a great escape for your tea lover. Individual bags of English Breakfast tea are tagged with quotes from your favorite authors. They make a great gift for everyone from your mother to your favorite English teacher. Tea Leaf Reading for Beginners is sure to amuse and wow. I’ve read several books on how to read tea leaves, and it’s one of the best. Filled with great instruction and examples, I’m always amazed at how accurate readings are with it. With this tea gift, a cup of tea takes on a whole new meaning! The Tea Forte World Of Teas Single Steeps Loose Tea Sampler provides the perfect amount of tea for the perfect cup of tea every single time. Whether you’re looking for a gift for a tea connoisseur or a tea beginner, this gift will allow them to enjoy a variety of artisan crafted loose teas. Looking for a super simple way to add lemon to tea? This professional lemon squeezer is a stylish gift that allows you to add lemon juice directly to a cup of tea without any mess. These all-natural, sugar-free green tea mints are made with organic and fair trade certified green tea. Not only do they help prevent bad breath, three mints have the same antioxidant benefits as one cup of green tea. And they’re tasty too! These handcrafted owl mugs are sure to bring a smile to your loved one’s face. They really hit the mark for the perfect tea gift. Buckingham Palace Tea is one of my favorite teas. It’s a special blend that is served at Buckingham Palace. It has flavors of Earl Grey and jasmine. A beautiful tea with flecks of black tea and blue flowers, it makes a great gift for tea lovers. With a gift of this Iced Tea Maker, your tea lover can make fresh-brewed iced tea from loose leaf tea or tea bags in minutes. Making iced tea is as simple as putting tea in the pitcher, adding water and ice, and drinking delicious iced tea. BPA-free with an airtight lid to keep it safely stored in the fridge… it doesn’t get any better than that!